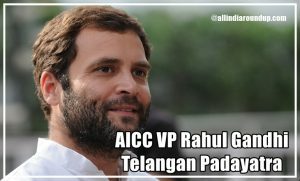 All India Congress Committee vice-president Rahul Gandhi on Friday morning commenced the eagerly-awaited Kisan Sandesh Yatra from this village in Nirmal revenue division of Adilabad District in Telagnana. Launching his 15-km padayatra to call on the families of distressed farmers, Mr. Gandhi accompanied by hundreds of party cadres and leaders reached the residence of Velma Rajeswar, a marginal farmer, who committed suicide earlier this month. Mr. Gandhi met Gangavva, widow of Rajeswar and handed over a cheque of Rs.2 lakh to the family. The AICC vice-president spent few minutes with the family and enquired about the debt Rajeswar had taken. He asked Gangavva, as to how the incident took place. After handing over financial assistance, he set out on his onward journey in the bullet proof SUV due to security reasons. A km from Koratikal, he got off the vehicle and began his padayatra towards Laxmanchanda, where he is expected to meet two families Soodi Lasmanna and Bondla Linganna. The small village apparently could not cope up with the heavy rush of Congress workers, who crowded all available lanes and bylanes. The convoy of Mr. Gandhi could not move into the lane where Rajeswar’s house was situated. SPG personnel had to whisk him away into the house for an interaction with the family. Outside the village, euphoric scenes were witnessed as the enthusiastic Congress workers sporting party caps and carrying huge flags marched ahead of Mr. Gandhi’s convoy. Equal number of workers also trailed the Congress vice-president, as he briskly walked to Laxmanchanda mandal headquarters. During his padayatra, Mr. Gandhi will also meet the families of Shatam Gangadhar and Paspula Laxman, who ended their lives due to mounting debt and crop failure. He will wind up his tour by addressing a rally at Vadial village and travel to Hyderabad for his journey to Delhi on Friday night. Congress vice-president Rahul Gandhi, who is on his ‘kisaan padyatra’, on Friday handed over a cheque worth Rs two lakh to the family of Rajeshwar, a farmer who had committed suicide. 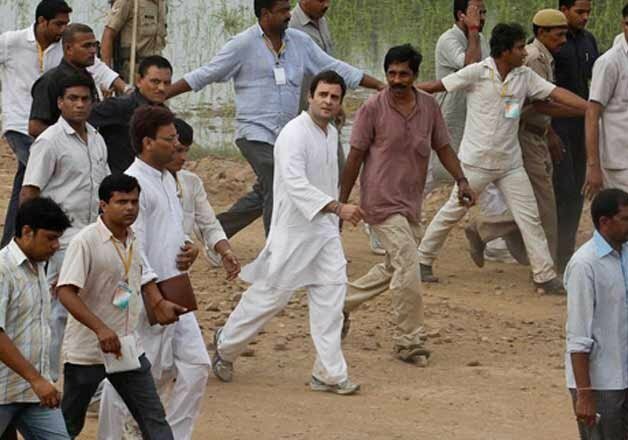 Rahul began his 15-kilometre long march from Nirmal in the Adilabad district of Telangana. The Gandhi scion had earlier raised farmers’ issues in the Parliament and also reached out to farmers in Punjab and the Vidarbha region of Maharashtra. According to reports, over 900 farmers have committed suicide in the state due to the agrarian crisis.Telangana ‘padyatra’: Rahul Gandhi hands over cheque to farmer’s family. Stay tuned wit us for more info and live updates, Pres Ctrl+D to bookmark us in your web browser.